Personal projects tend to drag on forever and ever. 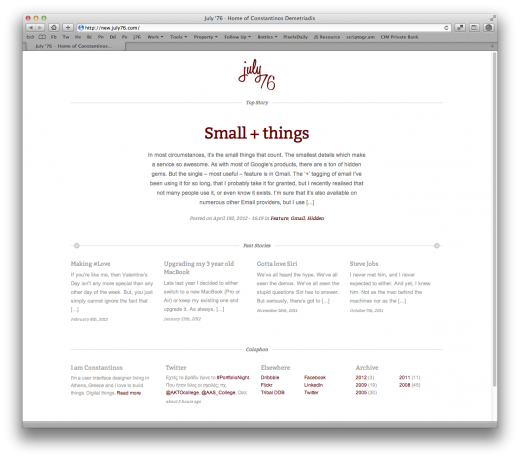 This is no different than the blog design you’re looking at right now. Initially designed back in 2010, I only managed to start developing it the last few months, and late last night I put in some final touches. Needless to say, it’s not done yet. It’s the same old story over and over again. Whenever I start creating something for myself, I always get caught up in some minor detail – be it a design problem, or development. It always needs to be *perfect*, but never is. Reference: here’s what the blog looks like today. This time, I finally managed to deliver my blog. It’s a far cry from what I planned on doing, but it is way better than any other default theme I could have used – and have used in the past. So, here’s to finding the time to work on your own stuff! Here, here! I guess it goes without saying that this blog will eventually turn into a site, and also accommodate my portfolio, which currently lives at ohmylovely.com.